New opinion piece by Dr. Heather Keller (Schlegel Research Chair in Nutrition and Aging, and a Professor in the Department of Kinesiology, at the University of Waterloo) on the new Canadian Food Guide. We are introducing two new requirements for all submissions to Implementation Science, which take effect February 1, 2019. Beginning February 1, 2019, we will require all manuscripts submitted to Implementation Science include a bulleted statement describing what the paper, if published, would add to the literature in implementation science. The federal government is phasing out a 30-year-old funding program known for connecting teams of scientists across Canada and encouraging them to work together in key areas of biomedical and environmental research, The Globe and Mail has learned. Editorial: Hospital culture and clinical performance: where next? Dementia is a devastating, costly chronic disease that has become a health priority worldwide. As of 2016, just over 42,000 Albertans have been diagnosed and are living with dementia. If nothing changes, this number is expected to increase to more than 155,000 within 30 years (source: the Population Estimates of Dementia in Alberta Working Group). 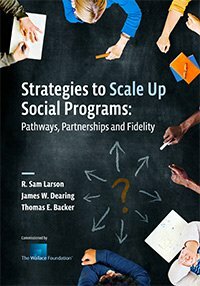 In successfully scaling up social programs through partnerships, 45 diverse nonprofits faced three key choices: their partner, their approach to spreading their work, and their call on the balance between fidelity and flexibility at the expansion sites.